A complete guide to the best day trips from Santorini, packed full of cool ideas and useful information! 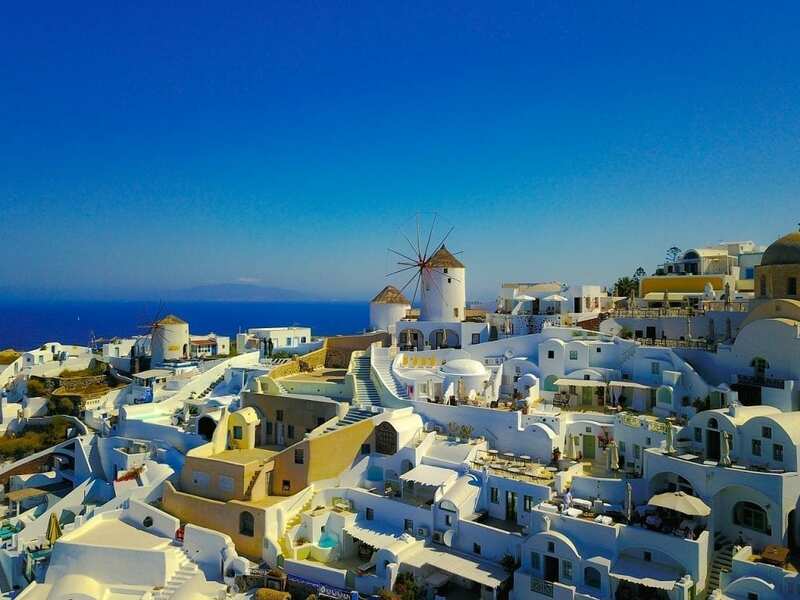 Includes popular Santorini tours like the sunset cruise and volcano trip, as well as how to get to the Greek islands near Santorini such as Crete and Naxos. If you plan to visit Santorini soon, make sure to read this Santorini day trips guide first! 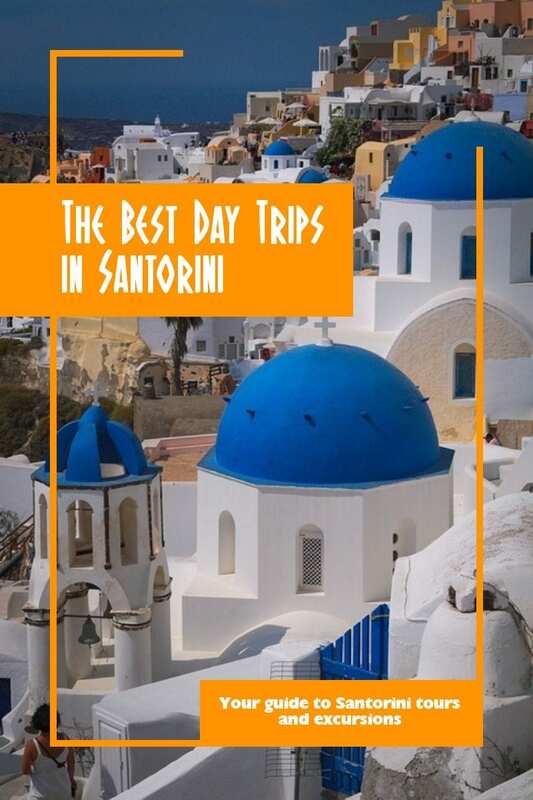 If you are staying for more than 2 days in Santorini, you might be interested in taking one or more of the Santorini day tours on offer. This way, you'll get to see the island from a different perspective, and also a little bit more of Greece. There's a number of Santorini excursions to choose from, including trips to nearby Greek islands, sailing experiences, volcano treks and more. Let's dive right in on what to do in Santorini for a day tour. The most popular Santorini day trips by far are the volcano boat tours. There's a number available, some of which do vary in what they offer. 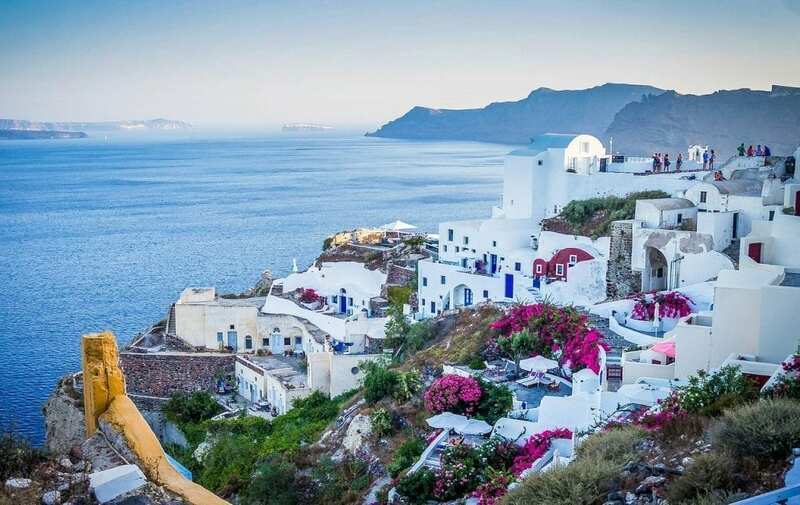 The standard package, so to speak, includes a cruise over to the volcano, some time spent walking on the volcano, time at some hot-springs, and then a cruise back to Santorini. Different variations might include a sunset or private yacht. I've taken the Santorini volcano and hot springs tour, and found it to be quite enjoyable, mainly for the great views of Santorini you can experience from the boat. I've put an option below for the Santorini volcano cruise. A Santorini sunset cruise is another popular option for people seeking to witness the beautiful Santorini sunset from a different angle. There are half and full day Santorini boat tours available which time their return with the sunset. Not only do you get that magical moment as the sun slowly disappears, but you also get to spend time sailing around one of the most beautiful islands in Greece! Take a look below, and decide which Santorini sunset boat tour suits you the most. The caldera is a stunning feature of the island's landscape, whether enjoying it during a walk from Fira to Oia, or as seen from the sea. Taking a Santorini caldera cruise lets you see the island from a variety of different angles. It's also a great idea for anyone keen on taking photos and video. As with a lot of these Santorini boat trips, you can take one which will also include a sunset. There's a number of different caldera cruises available, which you can see below. In addition to the cruises already mentioned, there are countless different options for Santorini sailing trips. Some of them circumnavigate the island, others visit remote beaches, and others still head out to the small islands close to Santorini. Available as group or private tours, a sailing trip is a great choice for people who want a day of fun and relaxation. I've included a few popular Santorini sailing day trips below. A fun way to see the island from the air is on a Santorini helicopter tour. A 20 or 30 minute helicopter flight over Santorini is a great way to view the island from a different perspective, and get some unique photos and video. Swoop over the caldera, fly above the villages, and check out the beaches below during the flight. A great way to see experience the beauty of this stunning island! More info below. To be fair, most people normally take a day trip to Santorini from a nearby island than from it. For example, day trips from Crete to Santorini are a lot more popular than the other way around. The other issue, is that whilst the rest of the Cyclades islands look close to Santorini, the ferry times are not very convenient. Day trips to Naxos and Paros for example are not really practical for this very reason. Still, it is possible for good planners to arrange independent day trips from Santorini to Folegandros, Sikinos, Anafi, and Ios. Anyone willing to take a private day trip to the Greek islands near Santorini would have better luck, especially if they want to charter their own boats and yachts. Here's a few ideas to get you started. As mentioned, the day trip is most popular in the reverse direction, and the majority of people would choose to spend a lot longer in Crete than just one day. The only reason I have included the Santorini to Crete day trip information here, is because a lot of people ask about it! Still, if you are determined to go ahead come what may, then I can suggest one novel way of attempting it. Take a helicopter transfer! Information about the Santorini to Crete helicopter charter below. Mykonos is another well known Greek island, famous for its party life and jet-set crowd. As a day trip though, is it really worth it? Perhaps only if you wanted to experience the nightlife without sleeping, and then return in the early hours of the morning! Seriously though, you can just about make a Santorini to Mykonos Day Trip using the local ferries. You would just need to ask at a travel agent when you are in Santorini for the latest ferry times. You could also charter a helicopter again, or a yacht. Information on these private charters for the Santorini to Mykonos day trip are below. If you are going to do it, do it right! The small, calm, and very un-touristy island of Anafi is arguably the island that it makes the most sense to visit on Santorini excursions. As most people concentrate on the ‘big name' islands and tick places off their itinerary though, it gets overlooked. This means it has very few tourists, is unspoiled, and has a touch of the wild side to it. Of course, it's got all those great aspects you might expect such as sandy beaches and clear warm waters as well! The ferry from Santorini to Anafi takes between 1.5 and 2 hours, and you arrive in the pretty Anafi port of Agios Nikolaos. Ferries normally leave Santorini early, meaning you get a full day on the island. Check local travel agents for ferry times and tickets. Ios developed something of a party reputation in the 90's, something which is is still struggling to shake off to this day. That's a shame really, because the beaches are some of the best in Greece. Whilst it certainly appeals more to people of a younger generation, it could be a good choice for people looking for something a little different during a day trip from Santorini. The ferry journey takes less than an hour from Santorini, but can be relatively expensive when compared to other ferry ticket prices. 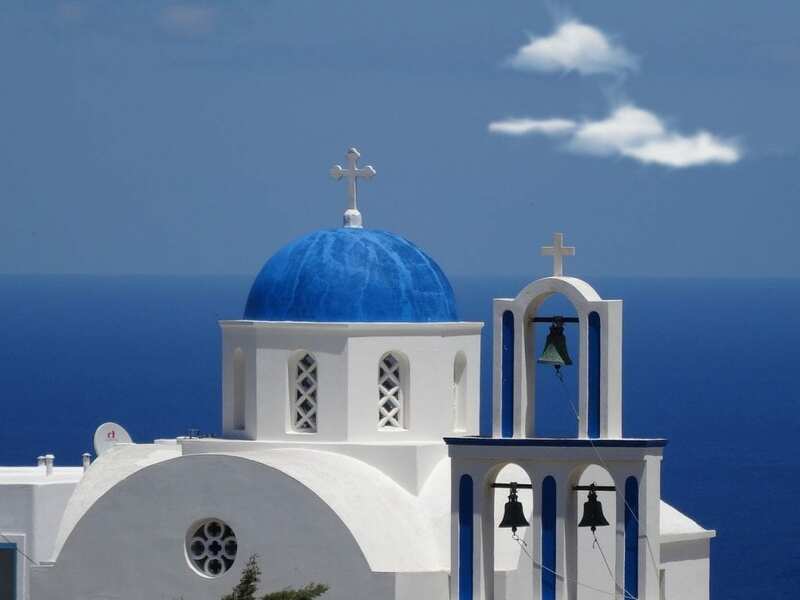 Once again, ask for schedules and tickets in Santorini travel agents, but perhaps consider staying a night rather than just a day tour from Santorini. Folegandros is mostly visited by Greeks who prefer to stay away from the masses of tourists visiting some of the bigger name islands. Although it is increasing in popularity, it still retains its beauty. The Chora is regarded as one of the most picturesque in Greece. The island certainly has an undeveloped feel to it, with many beaches only accessible by boat or down rocky paths. It's also a good destination for hiking. Folegandros is about 3 hours away from Santorini by ferry. In my opinion, there is enough to do there to warrant at least a one night if two night stay. However, if you are limited on time, it is just about possible to take the Santorini to Folegandros day trip using ferries. Ask at travel agents in Fira for schedules and tickets. If you would like more ideas on what to do in Santorini, please sign up for my Greece Travel Guides newsletter. I'll share the very best of the best blog posts and travel information with you, so you can plan a perfect trip to Santorini. Do you have any questions? Leave a comment below, or send an email over to dave@davestravelpages.com and I'll do my best to answer as quickly as I can! My husband and I are planning a trip in June. We want to go To santorini but are planning on seeing Italy as well so we have to split our time accordingly. We will be in santorini 3 full days. I would like to spend time relaxing near warm clear water. Is santorini the place for this? I keep reading the beaches aren’t great but I’m not sure if that just means not great because they don’t have the typical white sand. Is there a day trip you’d suggest? Thanks! Your info is so helpful! In June the waters will be warm enough to swim. I would say that the beaches aren’t the best when compared to other islands though. My reasons would be to do with the sane, but also the amount of people and general feel of them. I would suggest a sailing day trip that offers plenty of swimming stops perhaps! You might also be interested in a more recent guide I just published – 3 days in Santorini. Hi Dave! You have a well thought out and in-depth blog that is realistic, resourceful and help. Congrats! I scoured your blog and have put together a itinerary for travels to Italy and Greece this June. The stops include, Rome, Positiano, Bari, Athens, Santorini and I’d like one more island to visit (Crete, Ikaria, Navagio Beach or Lefkada). I haven’t quite figured out proximity from Bari to Greece or what the first stop from Bari (by ferry assuming) makes more sense. Would you be able to provide detail on which ferry or transportation mode from Italy would work best to Greece and the islands? Thanks! Glad you have found the blog useful so far! I’m not sure what ferry company would be the best, but I would suggest getting a ferry to either Igoumenitsa, Patras, or Piraeus (if possible) in Greece. I did hear that Bari-Patras is operated by Anek Superfast – so a place to start looking. The city of Brindisi in Italy also has many options to choose from. You might find that catching a flight into Athens sets you up better and saves some time. Check out the budget airlines such as Ryanair. For your extra island – Ikaria is a very interesting choice and I’d love to hear how you get on there! For beaches, Lefkada has some very nice ones. Thank you Dave!! I saw pics of Ikaria on Instagram but not much further research on how to get there. Crete seems to be the easier island to visit. I saw day trips from Santorini. I have more research to do and look forward to finalize the trip this week. Dave’s Travel Pages has a number of affiliate links placed within the travel blog. If you decide to buy items through these links, you will be helping Dave to fund this site and perhaps the next adventure. More importantly, it doesn’t cost you anything extra. Win win – we like that! "Copyright Dave's Travel Pages (c) 2005- - 2018 "